St. John’s sits in a town once called Prairie La Port, meaning “the door to the prairie,” the first name given to Guttenberg by French explores in 1673. The German immigration began in 1845, and by 1850 the town was sizable and now nearly all German, most of whom came from Cincinnati, Ohio. The city takes its name form Johannes Gutenberg, the inventor of movable type. Guttenberg was incorporated in 1851. The influence of the German population and their craftsmanship can be seen in the construction of over one hundred stone buildings between 1845 and 1865, many of which, are now on the National Register of Historic Places. The original 50’ x 70’ church was part of this explosive construction boom, started in 1854, it was completed in 1857. Prior to this, services were held in private homes and in the school building. The group that met to organize a new church was comprised of Lutherans and Reformed, they chose the name, “German United Lutheran Reformed Congregation” (Deutsche Vereintgte Lutherishe Reformierte Germeinde). Because the pastor from Garnavillo could not conduct service often, the congregation decided to call its own full-time pastor. Advertisements were taken out in the Cincinnati and St. Louis newspapers. Pastor Serstling was called to be the congregation’s first called pastor. When the new church was completed, pastor Adams was called, but only remained here a short while. Several of these early pastors came from the Missouri Synod, even though our congregation was not officially affiliated with any Synod at that time. By 1876, the Ladies Aid Society, Choir and Sunday School had been established. By 1879, the congregation was now totally made up of Lutheran members, so it was decided to reincorporate the congregation in 1880. In 1891 the Luther League was formed, (a tradition that continues to this day). 1895 A parsonage was built and the living quarters were removed from the church building itself. 1923 A group split off from the congregation to form St. Paul over their desire to be allowed membership in the Masonic Lodge and to have their worship services in English. 1928 The minutes of the church appear for the time in English instead of German. 1931 The pastor and a group of members left to form Trinity Lutheran Church (LCMS). 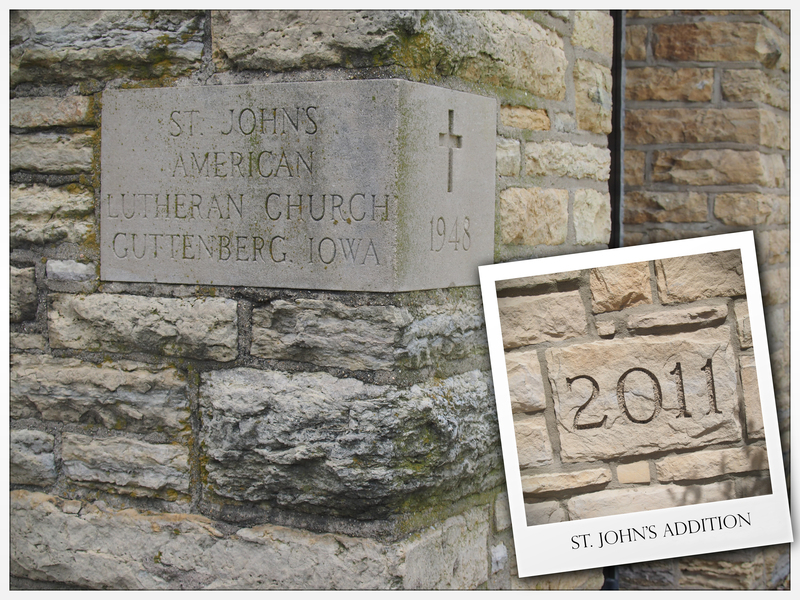 1933 The congregation was again reorganized under a new constitution and articles of incorporation and now bore the name St. John’s American Lutheran Church. 1934 The congregation became a member of the American Lutheran Church (ALC). For over eighty years the congregation had not belonged to any synod, although was loosely affiliated with the Ohio Synod for a time. 1937 Another watershed year for the congregation as services were conducted in English for the first time, although some services in German continued for a few more years. 1941 A Brotherhood was formed. 1947 It was decided to build a new church after discovering problems with the original building’s walls. The old stone church was dismantled by the men of the congregation, with much of the stone being reused in the building of the new church. 1949 The new church (our current facility) was dedicated on December eleventh of that year with much celebration. 1954 The installation of the beautiful stained glass windows began with the “Jesus praying in the Garden” window above the altar (imported from Italy costing one thousand dollars—a tidy sum in those days), with the rest of the windows being completed in 1959. 1965 A new parsonage (living quarters for a pastor) was completed and dedicated just North of the church and is still in use today. 1973 Another watershed year for St. John’s as the congregation began being involved or supporting of different ministry arrangements including Clayton County Lutheran Area Ministry, a yoked arrangement with Elkport-Littleport parish, a four-point area ministry and now a two-point parish with St. Paul in Guttenberg as well as a companion congregation in Namibia, Africa. For about one-third of the previous thirty years, St. John’s has been involved in a partnership of some kind where two pastors have been serving our membership. 1994 A new constitution was adopted as we joined the newly formed Evangelical Lutheran Church in America (ELCA). The strength of St. John’s has always been in its educational and youth programs, which included many youth mission trips to the and service opportunities. 1997 A new Saturday evening worship service was added along with a variety of different worship styles and ecumenical services and programs including; Community VBS, Live Nativity Walk, Stephen Ministry, youth events, Christmas Eve and Thanksgiving worship, etc. 2012 A new Narthex Additon was completed and dedicated on February 19th, 2012. The new narthex addtion provided much needed space for Sunday School, fellowship, as well as providing additonal restrooms and handicap accessibility.